Three hundred years of growth, struggle, and innovation have resulted in some amazing stories – people and events that helped shape our nation. In 1728, residents of Chester County complained that “Thieves, vagabonds, and ill people” had infested the westernmost areas, and petitioned that a new county be created. And so Lancaster County was created from Chester County in 1730. Lancaster was capital of the nation for one day - September 27, 1777 – when the Continental Congress fled Philadelphia and met in the Lancaster County Courthouse. They moved on to York. Prominent resident Edward Shippen, moved to Lancaster in 1751. He had been mayor of Philadelphia. He was active in Colonial and Revolutionary affairs. His granddaughter was married to Benedict Arnold. Timothy Matlack lived on E. Orange Street during much of the Revolutionary War. He was the Clerk of the Continental Congress when it approved the Declaration of Independence and Articles of Confederation. He penned the Declaration of Independence for members to sign. An early ordinance prohibited smoking on the public streets. The first man fined was John Passmore, who became Lancaster’s first mayor. Lancaster’s George Ross, signer of the declaration of Independence, introduced his niece Betsy to George Washington. At his request Betsy Ross created our nation’s first flag. City ordinances in the 1740’s included – no firing guns on the streets, no riding horses on the sidewalks, no letting pigs run loose on E. King Street, and no doing business in shops or taverns on Sundays. In 1793 a serious epidemic of Yellow Fever in Philadelphia killed 5,000 people. Lancaster residents collected and delivered to Philadelphia hundreds of barrels of flour, over $1,000 cash, and wagonloads of clothing. The first newspaper, “The Lancaster Gazette” was published in 1752. News articles were written in English and German. The Lancaster Journal began in 1794 as a 4-page weekly. It’s name was changed to Lancaster Intelligencer in 1821. In 1763, Lancaster gunsmith William Henry built a steam engine for a model stern-wheel boat that he tested on the Conestoga River – it sunk. It was the first trial of a steamboat in the world. Steamboat pioneers, Robert Fulton and John Finch often visited his home for ideas. The largest pipe organ in the nation was built by David Tannenberg for Trinity Lutheran Church in 1771. Lancaster’s Andrew Ellicott surveyed, revised the original plan, and drafted the map of Washington, D.C..
Trinity Lutheran Church was completed in 1794 with the new bell tower and 195-foot steeple, making it the tallest building west of Philadelphia. In 1803 Lancaster got its first bank. Prior to that, merchants and traders kept cash and loaned money to meet their own needs. Lancaster elected its first mayor, John Passmore, in 1818. When he died in 1827, there was no hearse large enough to transport the 480- pound man. His casket was carried instead on a wagon. In 1794, a four-horse stagecoach left from the “Fountain Inn” on S. Queen St. every Monday, arriving in Philadelphia the next day. Franklin and Marshall College was founded in 1787 with financial assistance from Benjamin Franklin making it one of the oldest in America – the result of a merger between Lancaster’s Franklin College and Mercersburg’s Marshall College in 1849. Planks were laid on logs to create a smooth plank road that extended from N. Queen St. in Lancaster to the borough of Manheim. It became a popular racetrack for local horsemen. The Lancaster-Philadelphia Turnpike was completed in 1794, but there was no bridge across the Conestoga River. Wagons and stagecoaches had to ford the river until a privately owned bridge was built in 1800. Lancaster’s Union Fire Company was formed in 1742, based on an idea of Benjamin Franklin. It was the first in the nation. Members of early fire companies were required to provide their own leather buckets to fight fires, and bags or baskets for removing valuables. Raising silkworms and making silk were major industries here in the late 19th and early 20th centuries. Thousands of Mulberry trees were planted in Lancaster and Lancaster County for feeding silkworms. The Stehli Silk mill was the largest in the nation and the second largest in the world, employing over two thousand workers in the 1930s. 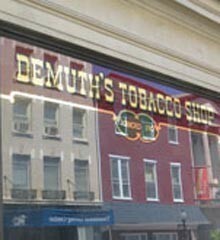 The Demuth Tobacco Shop on E. King St was established in 1770 to manufacture and sell snuff and cigars. It is the oldest tobacco shop in America. Lancaster served as capital of Pennsylvania from 1799 to 1812. State offices were in the old City Hall. James Buchanan while President of Franklin and Marshall College Board of Trustees, was responsible for selecting the current site of the College. On a wager in 1873, the Benjamin Mishler house on S. Prince Street was built by a small army of men in just 10 hours. The house is still a residence. John Wise of Lancaster was a pioneer in ballooning, beginning in 1835. He made regular ascensions from Lancaster, including Penn Square, and other Pennsylvania communities. The Lancaster jail, completed in 1851 on E. King St., was designed just like the old Lancaster Castle in Lancaster, England. The Lancaster City Water Works reported that there were nine bathtubs in Lancaster in 1839, supplied by the Conestoga Creek. Streetcars operating in Lancaster were horse drawn until 1890, when they were replaced by electric trollies. The Follmer Clogg Umbrella factory on W. King St. was the largest in the world. The building now provides housing. Armstrong Cork Company made linoleum in Lancaster. It was the world’s largest flooring manufacturer and the city’s largest employer for most of the 1900’s. The Fulton Opera House on N. Prince St. is the oldest ‘living’ theatre in the United States. The Heinitsh Apothecary Shop on E. King St. opened in 1730 was the oldest drugstore in the country. It stayed as a family operation until closing in 1934. In 1903 The Safety Buggy Works, located on N. Plum St., was the first company in America to build an automobile. In the early 1900’s, whenever a circus came to Lancaster, the troupe would parade through the streets with elephants, cages of wild animals, clowns and other performers, past thousands of onlookers. Lancaster’s Barney Ewell, a sprinter, won one gold and two silver medals at the 1948 summer Olympics in London. The fact that tobacco was the leading cash crop in Lancaster County from 1840 to 2000, is evident by the many tobacco warehouses in Lancaster near railroad sidings. The nickname for cigars—“stogies”—originated in Lancaster, to describe the cigars smoked by wagon masters driving their Conestoga wagons. The early 1900’s were marked by the emergence of new industries with international presence, such as Armstrong Cork Company, Hamilton Watch Company, and the Radio Corporation of America (RCA). Lancaster lays claim to being the country’s earliest and last surviving market town. It was designed around a central market square and courthouse. Lancaster County’s agrarian economy still remains the driving force for prosperity. In 1879, Frank W. Woolworth opened his first successful five-and-dime store in Lancaster. His new form of retailing took off quickly. In 1900, he built Lancaster’s tallest building—a grand 5-story Victorian F.W. Woolworth store with roof-top garden for dining and entertainment, on N. Queen Street. 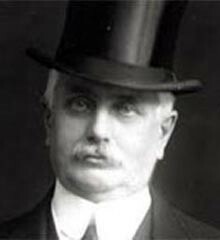 In 1913 he built the world’s tallest building in New York City—the Woolworth Building. When he was just fourteen, Milton Hershey’s mother paid for his apprenticeship at Joe Royer’s Ice Cream Parlor in downtown Lancaster where he worked for four years learning to make candy, including his own formula for caramels. His attempts to build a successful candy business in Philadelphia, and later New York, were failures. In 1886, after returning to Lancaster, Milton Hershey established the Lancaster Caramel Company with two employees - his mother and aunt. He sold the company in 1900 for $1 million and bought land, in what is now Hershey, Pennsylvania, to build the Hershey Chocolate Company. Hamilton Watch was established in 1892 in Lancaster. They made all types of timepieces, including the famous railroad pocket watches that helped keep trains on time. In 1957 they created the world’s first electric (battery powered) watch. Hamilton Watch Company was the owner of the world’s smallest oil refinery, producing just four quarts a year of a delicate watch bearing lubricant. The expression ‘with bells on’ originated in Lancaster. When a Conestoga wagon needed to be pulled out of the mire by another wagon, it was customary that the helpful driver be given the bells off the wagon in trouble. Arriving with ‘bells on’ was a sign of a successful trip. Early fire companies were comprised of the town’s most prominent citizens. They pulled the fire engines, manned the bucket brigades, aimed the hose, and carried large linen salvage bags to retrieve valuables. Some bucket brigades stretched five blocks from the water source to the fire. Early justice was swift and severe. Anne Toews, a young lady convicted of adding a zero to a one-shilling note, raising its value to ten shillings, was punished by the loss of an ear and a public whipping of twenty-one lashes. The fact that Lancaster was one mile away from the Conestoga River kept large industry, that required substantial waterpower, away from the downtown, preserving its character. Prominent attorney, William Atlee, was put in charge of the safe transporting of men and documents when the Continental Congress fled to Lancaster in 1777. Civil War general, John Reynolds, had a brother, William Reynolds, who was an admiral in the U.S. Navy. It is reported that many Lancastrians panicked when they heard reports that Confederate troops were marching on Pennsylvania and when they saw the smoke from the burning of the covered bridge that crossed the Susquehanna River. They gathered valuable possessions, money, and public records which they hid, buried, or shipped eastward by wagons. Steinman Hardware Store on W. King Street began operation in 1744. For over two-hundred years, until it closed in the 1960s, it was the oldest hardware store in the nation, supplying the needs of a growing town and a growing America as pioneers headed west. Lancaster’s last execution was in 1912. Railroad laborer Mr. Romezzo was sentenced to hanging for the murder of a fellow laborer. He was hung twice when the rope broke on the first try. The County, in a cost-saving effort, had chosen not to buy a new rope for its last execution. C. Emlen Urban was Lancaster’s first native architect. He worked from the 1890s to the early 1930’s. Many of the buildings he designed can be found throughout Lancaster, including the Greist building. The Serta Mattress Company started in downtown Lancaster in 1907 by John Herr, Sr. Earliest mattresses, before 1920, were filled with straw and corn husks. The company was a pioneer in the sale of innerspring mattresses. In colonial times brewing was a profitable and respected profession. Breweries were needed to supply the many taverns in Lancaster and on the roads leading out of town. During the 19th century Lancaster was regarded as the brewing capital of Pennsylvania. At the time of prohibition there were 14 breweries in Lancaster, and their product often moved through tunnels under the streets. Those delicious Easter marshmallow peeps we all know, were first created and sold by Lancaster’s Rodda Candy Company. In those days, marshmallow was laboriously hand-squeezed through pastry tubes. Two white women were criticized for dancing “wilder than the Indians” during a meeting at the Treaty of 1744 in downtown Lancaster. Lancaster’s Thaddeus Stevens killed a cow with an axe when he was a student at Dartmouth College. President Buchanan’s Lancaster home, Wheatland, has eight fireplaces, as well as an eight-seat privy. In 1890 there were 79 butchers operating at Lancaster’s Central Market.